My recent visit to Sandibe Okavango Safari Lodge was a refreshing reminder of how special a green season safari in Botswana can be. Not all parts of Botswana are equal once the rains arrive, so the key is knowing which areas to visit and which to leave for the winter months. Many of the good year-round game viewing areas are in private concessions with higher price tags, but the good news is that discounted green season rates make them more accessible to those on tighter budgets. Visiting these areas in green season will give you a great bush experience, as well as the bells and whistles offered at these camps year-round, but for a fraction of the price. The Chitabe concession, where you’ll find Sandibe, is one area of Botswana which remains great year-round. On a two night stay we saw a cheetah, two prides of lions with their cubs, a female leopard calling for her mate from the tree tops, a pack of wild dog, two male giraffes fighting over a lady friend, countless elephants, plains game and spectacular bird life. 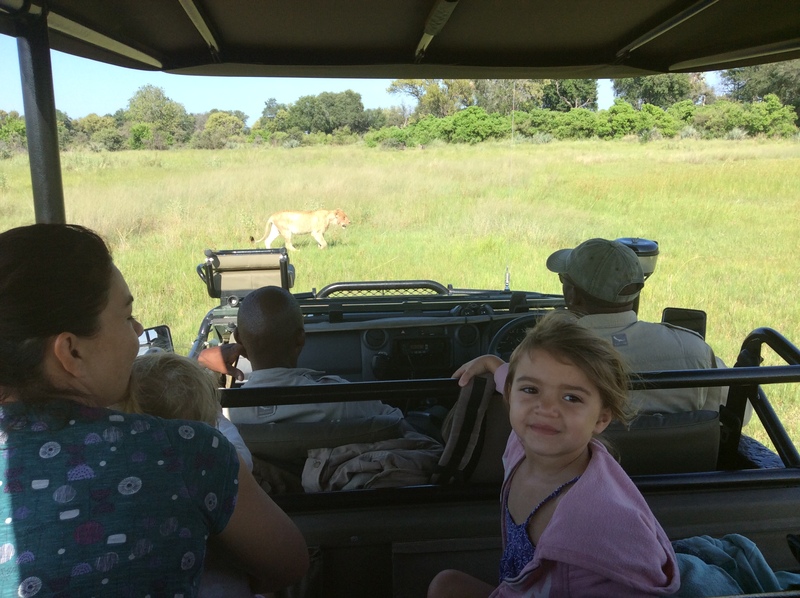 The problem we encountered is that my five year old now thinks this kind of game viewing is normal! Although temperatures were soaring, we were treated to a spectacular evening thunder shower followed by the welcome relief of a cool and cloudy day. I was travelling with my family, including my two young daughters Taylor and Megan. Travelling with small children presents its challenges but is equally rewarding. Megan may only be able to say a handful of words but she can now mimic a baboon beautifully! The staff at Sandibe catered to the kids perfectly and were ready to assist and entertain at every turn. 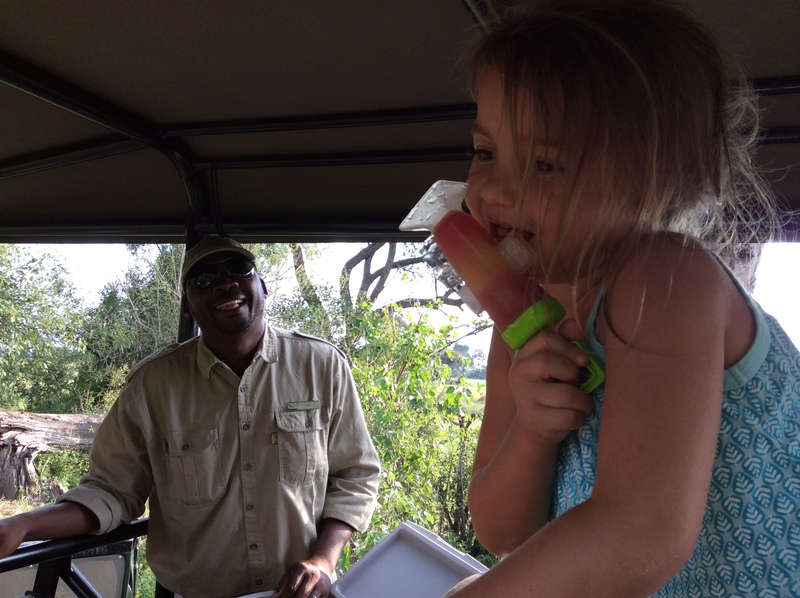 Taylor was welcomed on arrival by a goodie bag filled with safari nick-nacks and squealed with delight when we stumbled upon a cooler box hanging from a tree during our afternoon drive, only to find it filled with home-made ice pops. Meal times were flexible and the kiddies’ menu put my home cooking to shame. Having our own private vehicle and guide allowed us the freedom to come and go as we liked without worrying about other guests and our guide and tracker were constantly engaging the children. 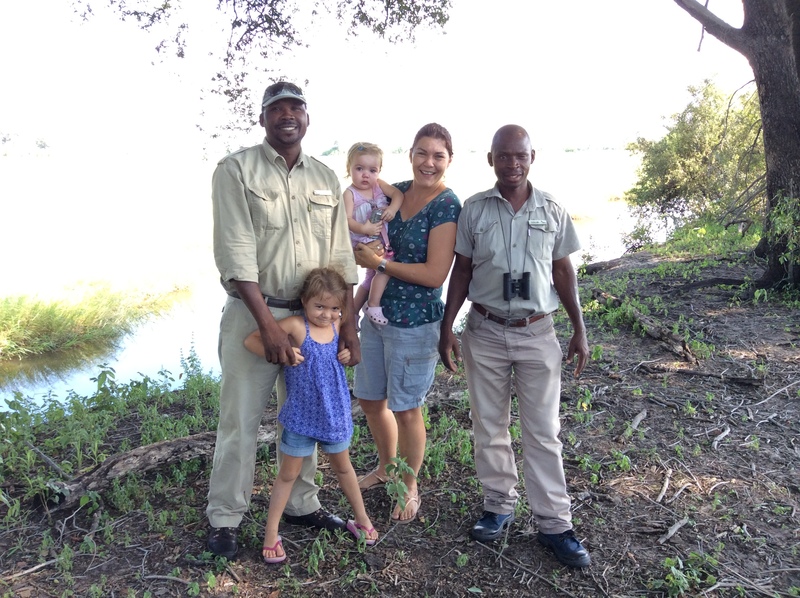 For families saving up for a once in a lifetime safari, the minimum age of six years and up ensures kids experience the bush when they’re at an age to appreciate and make the most of it. Sandibe caters brilliantly to the grown-up kids as well. Whilst I have been lucky enough to visit many camps over the years, this was my second visit to &Beyond, and the second time I have been blown away by the food experience. So many operators fall short when it comes to what their kitchens produce, using the excuse that a safari is about the wildlife and not the food. With &Beyond, you can have your cake and eat it – Sandibe delivered to the very highest of standards, both on the game viewing and the culinary treats. 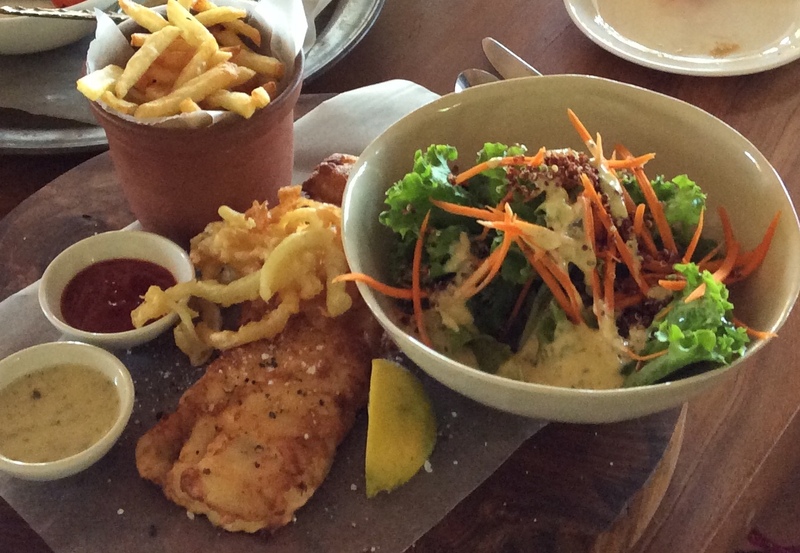 Indulging in naughty delights is a big part of what being on holiday is all about and at Sandibe, they know how to make every calorie count. The design and amenities at Sandibe are both cutting edge and controversial in the safari world. The lodge lacks the true sense of being in the outdoors that you’ll get when staying in a more rustic tented camp. I didn’t leave with my clothes smelling of campfire smoke, nor did I lie awake excited by the sounds of the night as the hum of air-conditioning blocked out external noises. I did however enjoy the luxury of a plunge pool during the heat of the day and cold drinks in my room during afternoon siestas, as well as the private butler and consultations with the chef during meal times, creating a very personal experience. Whatever you prefer is a matter of choice and there are many first time safari guests who would take great comfort in the solid structure of the rooms (no canvas walls here!) and the modern comforts on hand. The design of the camp is spectacular, though I’m curious to see how the buildings will age under the challenges of maintaining a camp in the bush. Despite the money and expertise put into the design of the camp, there are a few obvious design flaws some guests may find frustrating. For the level of the camp, the rooms could have more room, and unless you’re extremely comfortable with your co-traveller, a lack of privacy in the rooms will require advance coordination of shower times. All in all we had an incredible weekend and I can highly recommend Sandibe on every level. Back to the office and my diet on Monday!